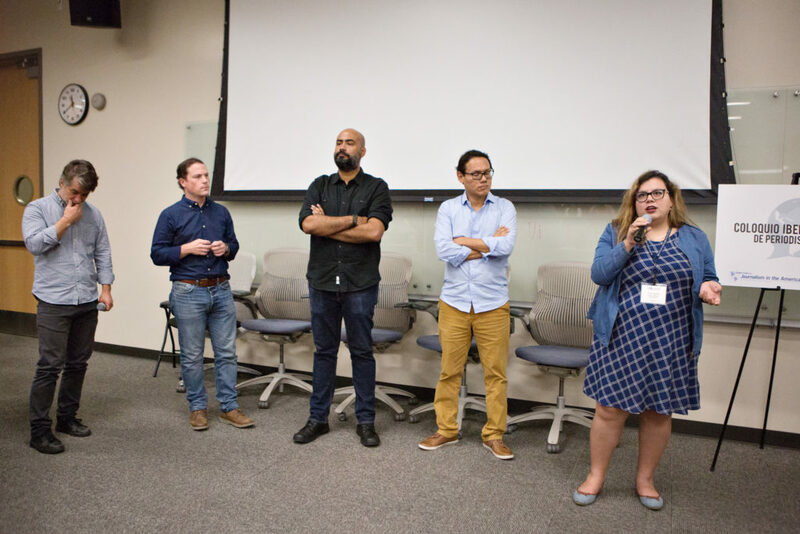 Cybersecurity, legal shields and working in alliances are some of the fundamental factors to consider when conducting journalistic investigations on corruption issues in Latin America, according to speakers on the Corruption Coverage panel, held during the 11th Ibero-American Colloquium of Digital Journalism in Austin, Texas on April 15, 2018. The participants of the event, which took place in the context of the 2018 International Symposium on Online Journalism (ISOJ), shared how they have reported on cases of corruption that have been revealed in the region in recent years, such as the Lava Jato scandal, the Panama Papers, the alleged illicit financing of political parties in Peru or the “Master Fraud” of the Mexican government. One of the cases reported was “The Master Fraud,” which revealed what is considered the most institutionalized corruption scheme reported in Mexico. The investigation was conducted in conjunction with Animal Político and recently won the Ortega y Gasset Journalism Award for Best Story or Journalistic Investigation. Darío Ramírez, of Mexicanos Contra la Corrupción y la Impunidad, said that their investigations have cost them nine audits by Mexican tax authorities, as well as being targeted by the government through malware. “Now the information is being criminalized,” said Joseph Poliszuk, editor of the Venezuelan site Armando.Info, who along with other members of his team had to travel to Colombia after being sued for an investigation that revealed groups of power that are allegedly doing business with the subsidized food program in Venezuela. Poliszuk said that if they went to trial, the law would prohibit them from publishing the story, so they decided to continue working on their investigation from abroad. The independent media that cover these types of cases must increase security for their teams on all fronts, according to the speakers. And the legal aspect is very important, given that on many occasions, the characters involved in the investigations choose to defend themselves by legal means. That is why having a good legal department that supports them becomes fundamental. César Fagoaga, editor-in-chief of Revista Factum, of El Salvador, shared that his team has a special security protocol that includes the monitoring of their reporters when they go out into the field, especially as a result of a report in which they revealed that an elite group of Salvadoran police was involved in homicides, sexual assaults against minors and extortion. “That evidently made us very popular in El Salvador,” Fagoaga joked. “We received a lot of threats. They invented posts on social networks about the journalist who wrote the article, including that they were going to kill him. Fagoaga said that they obtained protective measures from the Ombudsman’s Office for the Defense of Human Rights in El Salvador, but the authorities have not yet complied with them. For his part, David Hidalgo, journalistic director of the Peruvian site Ojo Público, said that it is also necessary to strengthen cybersecurity of an independent media when working on a corruption investigation. Hidalgo said that one of the four dimensions that Ojo Público takes into account to carry out such work is the encryption of data, which in many cases are the main ingredient of the investigations. After participating in the investigations of the Panama Papers and Paradise Papers, the journalists of Ojo Público realized the importance of making alliances with media from other countries, especially in cases where corruption plays an important role. In the case of the Mexican organization Quinto Elemento, collaboration is carried out by supporting independent journalists who do not have the means to carry out their investigations. After its first call for story submissions, the organization – which is supported by Open Society Foundations – received 120 stories, of which four have already been published. During the months of the investigation, the organization accompanies the reporter, their work is edited and alliances are sought to publish the story, so that it has the greatest possible impact, Muñiz explained.